Save the date for Big Give 2017! The Big Give SA is a 24-hour day of giving that brings donors and nonprofits together and connects people to the causes that matter to them the most. If our work for community cats matters to you we encourage you to donate May 4, 2017. And-because we win more prize money when we have the most unique, one-time donors-tell your friends and family to donate too! Even just the minimum of $10 helps us win! PEER-TO-PEER FUNDRAISING: Want to do more than donate? This year The Big Give will allow you to fundraise for your cause! Simply visit our page HERE and click the "Fundraise" button. You'll be prompted to create your personal fundraising page with your image, a compelling story about why you are fundraising for The San Antonio Feral Cat Coalition, and a donate button leading directly to our page. You can share your personal fundraising page with friends, family and coworkers to encourage donations! SCHEDULE YOUR DONATION! For the first time this year, one week before the fundraising event on April 27, donors will be able to make gifts early to San Antonio Feral Cat Coalition through the Big Give website.By giving early, you won't have to worry about missing the big day. All early gifts will count toward SAFCC totals for the Big Give amount raised and for overall prize money (1st place, 2nd place...category prizes), but they will not count toward hourly prize awards. SAFCC POWER HOUR: Last year-thanks to our wonderful donors-we were able to win an additional $1,000 during our selected Power Hour. We would love to do that again this year. If you want to maximize your gift, please consider giving during our Power Hour from 5-6 PM. The more people that donate during this time, the greater our chances to win, so tell family and friends! We are so excited for the Big Give this year and hope you are too! Remember, your donation helps further our goal to help community cats in San Antonio. Visit our Big Give profile HERE. Many thanks to Ducharme Marketing Group for their generous donation of cat food to SAFCC. The cat food and other cat supplies donated will be used to supplement our Colony Caretaker Food Program and our Community Cat Adoption Program. DMG is a great animal rescue partner that seeks to help animals get food and needed supplies and give them a chance for adoption through its Rescue Magazine. SAFCC at Bark in the Park! This month San Antonio Feral Cat Coalition was at Talk About It! SA's Bark in the Park-Perrito Grito 2017, adding a little "meow" to balance out the bark! It was a beautiful day at Rosedale Park with an estimated 1,500 visitors at the event. Many thanks to our volunteers Sandy, Christine, Marte, Donna & Monica for a great event! For more pictures from this event, visit HERE. Our board member Monica Caballero has worked with Alamo Heights High School students as they explore San Antonio community cats! The students will profile our organization in the Bexar County High School Film Festival! The film will follow a feral cat as it is trapped and goes through the process of becoming a TNR'd community cat! Premiere night is April 17! Find out more info HERE. SAFCC at Career on Wheels! SAFCC participated for the second year in South San Antonio ISD's Careers On Wheels. A fun and knowledge-filled event for students. Over 700 2nd graders walked with anticipation from vehicle to vehicle learning about numerous jobs or careers. They moved from H-E-B, to bulldozers & cement trucks to emergency services of all types, milking a cow, talking to marines and firefighters, animal organizations like ACS, SNAP, SAFCC and so many more. At our van the children were curious and interested watching the stuffed cat trapping demo by Sandy, but they were excited and full of giggles watching one of their own classmates carrying a giant net to catch Grumpy Cat, heroically played by SAFCC volunteer Monica. After a long and busy day, kids boarded their bus to return to their schools with knowledge about community cats, and visions of "Grumpy Cat" being caught and "Happy Cat" being released with it's tipped ear. A full day, a fun day! anyone you know feeding cats in 78217! Please call our Helpline to get traps: (210) 877-9067. For more info on our current grants and clinics, please visit our website. Cat stranded for two weeks rescued by SAFCC volunteer! On Lesa's first day as a SAFCC Helpline volunteer-in-training, she received a call concerning a cat stranded in the rafters of a church for 2 weeks! Lesa was in Houston at the time as her return drive to SA was delayed by a back injury. She got in her car to make the drive home with a large dose of Tylenol & Aleve on board. She drove straight to the church and was there until after midnight trying to get the cat down. The next day she went back out and stayed there all day until around 7:45 pm. The cat finally could not resist Petsmart canned salmon (Lesa's secret "no-fail" bait. She says cats love it!). She had much help through-out the day by church maintenance and neighbors, but it was Lesa's tenacity that won the day! Church Kitty is now recovering from his ordeal for a couple days before he makes his visit to the vet to get neutered and be returned a "new man," as Lesa says! Thank you for going above and beyond, Lesa! This is truly a remarkable rescue! 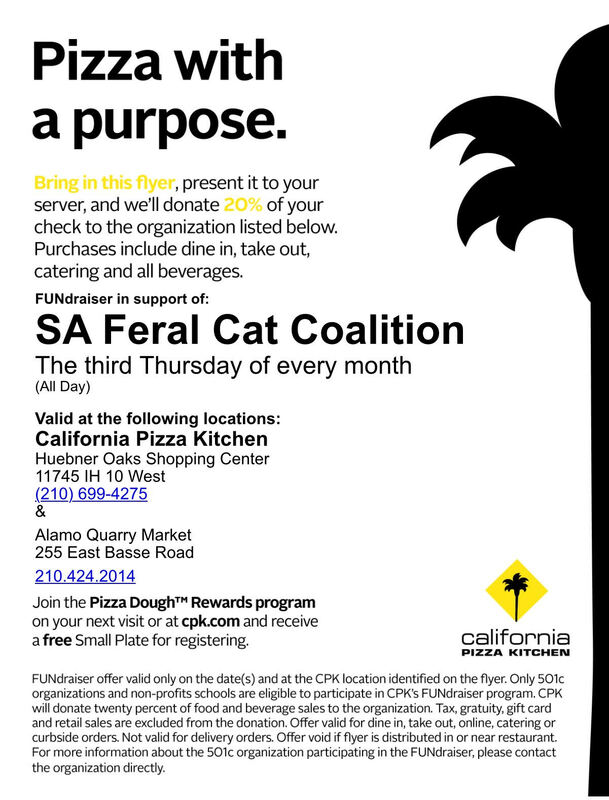 Have you been thinking about volunteering with the San Antonio Feral Cat Coalition but aren't sure how you can help? Then please stop by and see what our critical needs are at our Meet & Greet Volunteer Fair. Enjoy some light refreshments and meet other like-minded volunteers! We have many volunteer opportunities that range from trapping, advocating for community cats with HOAs, apartment complexes and business, TNR class volunteer, data entry, answering helpline calls, events, Petco store cleaners/feeders, trap loan volunteers and more! Whether you're able to commit to a little or a lot of time, we have something for you! Remember, we are an all-volunteer organization and need your help to continue our current programs! If you are interested in volunteering, we require you have attended a TNR class first to learn about what we do. We can only do what we have the resources to support and our volunteers are our most important resource! Celebrating a Birthday? Having a lunch meeting? Or just need to re-fuel while shopping.... Present this FLYER when you dine in or take-out on April 20 and 20% of your bill will be donated to SAFCC. Come out and enjoy beautiful Woodlawn Lake Park, a perfect setting for Earth Day! SAFCC will have a booth giving away catnip seeds - easy to grow and did you know they are an excellent mosquito repellant too? Stop by and visit with our volunteers, fosters and adoptable cats and kittens. Converse TNR meeting for interested residents. SAFCC will be hosting a meeting in Converse on Saturday, April 29, with the residents of Converse to talk about their community cat issues. This will be a meeting to gauge interest in forming a Converse TNR group, or to at least network with others interested in TNR in Converse. Because of the room's size, only Converse residents are invited to attend. If you know anyone in Converse that would be interested, please share this newsletter. TNR passed at the Converse City Council on January, 29, 2015.